This spray is very effective in killing ants among other insects, including spiders and crickets. Additionally, its preventative use keeps ants from getting in your home. The far reach makes it convenient and easy to use. Wondercide is a great choice for indoor use, especially in homes with pets and children, as it is non-toxic and completely natural. It’s also good for the environment while still being very effective in killing several types of insects on contact. Ortho has delivered an excellent long-term product that will give users lasting effects. Its water-resistant formula will stay put outdoors, and it can be used indoors as well without harming pets or children. Highly effective. Ant infestations and invasions can be such a hassle to put an end to. Luckily, several products aim to assist you in eliminating this issue. Coming in various forms such as sprays, bait, and poison, ant deterrents can act as quick-fixes as well as long-term solutions. It can be hard to determine which product is best for your unique needs, so we’ve picked the best of the best to suggest for you. Terro ant spray comes at an affordable price. It kills ants on contact. The spray works not only to kill but to prevent further problems. Terro ant spray works on carpenter ants as well as carpenter bees, Asian lady beetles, and boxelder bugs. The nozzle has a far reach, letting you spray in hard places or without getting too close. The spray doesn’t have an unpleasant smell. It will not work on fire ants. Some users report trouble working the spray can. The Terro Outdoor Ant Killer Spray is an excellent choice for keeping ants outside of your home. If you see ants around the outside of your house, this spray is good as a preventative measure: stop the problem outside before it reaches the inside. Terro ant spray instantly kills any ants on contact with the press of a button. Its powerful nozzle enables users to spray in places up to 10-15 feet away. This far range makes the spray a convenient option for hard to reach areas or highly infested areas that you don’t want to get too close to. In addition to working as a contact solution, Terro ant spray can be used to form a protective barrier around certain areas, like outside your doors, windows, and even the perimeter of your home. The perimeter will prevent ants from entering your house and is especially effective when ants are most active in the spring and fall. Wondercide comes in a variety of scents. It is made from all natural, non-toxic ingredients that are safe for children, pets, and the environment. Its effective ingredients kill ants and much more, like spiders, ticks, and earwigs. One bottle can effectively treat the perimeter of a 2,000 square foot home. Ingredients are locally-sourced and sustainable. Wondercide has a higher price point. It is not necessarily a permanent solution for larger problems. 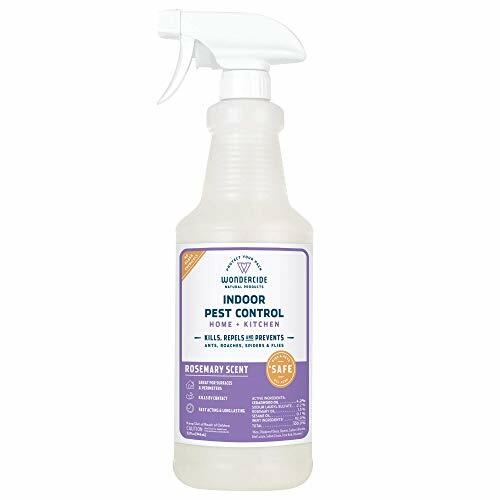 This versatile pest control spray is excellent for in-home use. Wondercide Pest Control Spray is made from natural ingredients and contains no harmful or toxic chemicals. This makes it safe to use all around your home and near kids and pets. It’s even safe to use in kitchens around food. Wondercide kills and repels several different kinds of pests, including ants, spiders, roaches, mosquitoes, wasps, fleas, and more. It works fast and won’t stain your household items, so it is safe to spray on things like furniture, carpets, and pet bedding. In addition to its powerful pest control capabilities, Wondercide pest control spray is also aromatherapeutic. It comes in four different scents: cedar, lemongrass, rosemary, and peppermint. These scents, rather than harsh chemical smells, are much more pleasant to use in your home. Ortho Home Defense can be used both indoors and outdoors. The indoor application can last as long as 12 months. The spray is effective as a kill-on-contact spray for several different types of insects. Home Defense works well as a perimeter defense around rooms, door, windows, and homes. The spray is odor-free and fast-working. The rain-resistant formula will keep the outdoor application in place longer. The spray will not bother pets or children. Outdoor applications tend not to last as long as indoor and need to be re-treated more often. If you are looking for an ant spray that will give you lasting effects, then Ortho Home Defense Max Insect Killer Spray may be a good option to look into. Ortho Home Defense is designed to last and control insects like ants, roaches, and spiders for up to 12 months. This non-staining formula can be used on any nonporous surfaces and creates an excellent barrier to fight off pesky insects. It’s odor-free, fast-acting, and kills insects on contact. Ortho Home Defense can be used to create barriers around any room. To achieve these strongholds, all you have to do is spray it around the perimeter of a room. Be sure to only use on floors that don’t have carpets. You can also create boundaries around windows, door, and cabinets, and you can even mark out the perimeter of your house to prevent insects from entering. The spray is rain-resistant and will not budge easily due to storms and wet seasons. Terro kills carpenter ants, termites, and other wood-eating insects on contact. It also works as a preventative method and can be used to form barriers. The spray is effective without having a nasty smell. It is fast-working and doesn’t stain. This can is very affordable and can save you from a much bigger problem. The small attachment is excellent for attacking tunnels and hard-to-reach crevices. Terro can be used both indoors and outdoors. Users report this product as not being a long-lasting solution if your problem is already too big. Terro Carpenter Ant and Termite Killer Spray works by killing both ants and termites on contact. Its formula is specifically developed to attack these stronger, wood-destroying insects and kill them on sight. Additionally, this spray offers residual control for up to four weeks, keeping you ant and termite free. The aerosol can comes with an attachment piece that can be used to spray into tiny cracks and crevices. This can help you attack those hard-to-reach places where the bugs are getting in through. This attachment is also great for attacking any tunnels wood-infesting insects have made with the home. Simply remove this attachment to use as a typical wide spray. This Terro spray is practically odorless, and it won’t leave a stain like other sprays. As a preventative method, this ant and termite killer can be sprayed indoors and outdoors, including around windows and doors to keep bugs out. We have provided you with some of the best ant sprays in the business, and now we would like to equip you with knowledge as well. Read on to learn the answers to some commonly asked questions concerning ants and ant spray. What is the difference between ant bait and ant sprays? Ant sprays are best for on-the-spot ant elimination and prevention. Ant spray can be used to kill the ants that you see in your kitchen, and some can be used to create barriers around a certain area. While killing on the spot is very useful, this product can prevent ants from entering your house altogether. will attract them and poison them. What active ingredients help to eliminate ants? The active ingredients in your ant eliminators depend largely on the company and their unique formula. Many ant baits use Boric Acid and other Borates. These ingredients are naturally derived ingredients. Companies sometimes use methoprene and pyriproxyfen. They are insect growth regulators that stall the ants’ development, killing them. Some other common ingredients you may find in baits are hydramethylon, neonicotinoids, and avermectin. Ant sprays tend to use different active ingredients than bait, as they are meant to kill on contact rather than slowly. Sprays often use botanicals, which are naturally occurring substances that can include thyme oil, hot pepper extract, limonene, clove oil, and linalool. Do I need different kinds of sprays for different kinds of ants? Many ant sprays use various chemicals that work to kill the ants. It can be hard to know if one works better than another. For this reason, companies will often make sprays that specifically target harder-to-kill ants. For example, our best ant spray for carpenter ants will most likely do a better job of killing carpenter ants than a non-specific ant spray will do. For small, general household ant problems, you don’t need to worry too much about looking into specific ant sprays. The sprays from the list above should do the job. However, bigger issues may require additional tools such as bait or exterminators. How do I know when it’s time to switch to long-term ant killer? Ant sprays are great short-term solutions to small ant problems. For example, you see a few ants on your counter, but there doesn’t seem to be a trail or a larger group somewhere in your house. An ant spray will do the trick to kill those worker ants, and your problem is solved. The problem arises when you start to see ants every day, and no matter how many times you spray them, more come back. Soon you may start to see their numbers grow, or you may notice trails of them coming from a crack in the wall or a crevice near your back door. At this point, you may have a larger problem at hand. If you weren’t able to catch the small problem while it was still small, you might have to heighten your efforts. One thing you can try is switching from a spray to bait. Bait will attract more ants at first, but you have to let that happen in order to kill the rest of the colony.